By combining our dental implant manufacturing expertise with our implant laboratory services, Glidewell Laboratories is the first provider in the industry to offer a complete solution for a missing tooth. The Inclusive Tooth Replacement Solution is the first truly restorative-driven approach for dental implant treatment. Glidewell Laboratories announced today the launch of the Inclusive® Tooth Replacement Solution. This all-in-one implant treatment package is the first to include the complete set of intraoral components a clinician needs to restore a missing tooth. 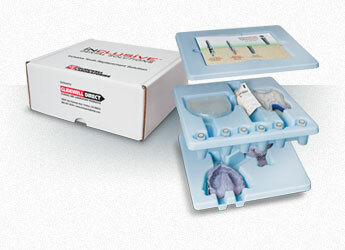 Featuring the unprecedented use of prefabricated custom temporary components for patient-specific soft tissue management that begins at implant placement, this simple, convenient solution is intended to offer an effective, streamlined process covering surgical, temporary and final restorative phases — resulting in a predictable outcome. Comprehensively priced, it also eliminates variable fees traditionally associated with implant treatment, allowing the clinician to determine total treatment costs up front. The solution features a simplified workflow intended to address planning, communication and component issues known to complicate implant cases between the surgical and restorative phases. From full-arch impressions, Glidewell Laboratories fabricates a prosthetic drilling guide to suggest the ideal placement of the implant for achieving restorative success, a custom temporary abutment with tooth-specific contours, and a BioTemps® provisional crown to immediately train the soft tissue to support an appropriate emergence profile. For cases where the implant cannot be immediately temporized, a custom healing abutment is included to train the soft tissue without loading the implant. Also included is a matching custom impression coping that allows for accurate communication of the implant position and soft tissue contours to the laboratory, which is critical to the design of an esthetic restoration. All of this is delivered to the clinician with the Inclusive® Tapered Implant of choice and corresponding surgical drills. When it’s time for the definitive restoration, the clinician takes an implant-level impression using the custom impression coping and sends it to Glidewell, where it is used to fabricate a final Inclusive® Custom Abutment (titanium or zirconia) and BruxZir® Solid Zirconia or IPS e.max® crown. These final restorative components are also included in the package price. The precision inherent in the Inclusive Tooth Replacement Solution stems in large part from the use of predesigned custom temporary components to provide patient-specific temporization and contoured healing. Soft tissue management of this nature better prepares the site for the final esthetic outcome, and is an exclusive feature of the Inclusive Tooth Replacement Solution. While techniques exist for the fabrication of custom temporary and impression components chairside, clinicians seeking to maximize clinical efficiencies and reduce chairtime will appreciate the convenience of having these digitally designed components arrive prepackaged and ready for placement, in the same manner as stock components. 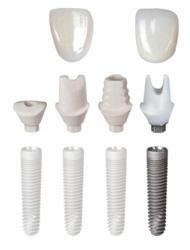 Backed by more than 40 years of experience and a strong commitment to excellence, Glidewell Laboratories has the product portfolio, infrastructure and competency to provide the full spectrum of affordable custom implant solutions to dentists. Our dedicated, full-service dental implant department of specially trained technicians has decades of experience in restoring even the most challenging implant cases from start to finish. Advanced CAD/CAM processing capabilities ensure precise, esthetic restorations that require fewer adjustments and remakes, reducing chairtime and leading to greater overall patient satisfaction. For more information, visit http://www.inclusivedental.com or call 800-407-3379. Glidewell Laboratories is a privately owned corporation that has more than 40 years of history as a provider of high-quality restorations to dental practitioners nationwide. It has its own 73-person Research and Development team, and is the most resourceful dental laboratory in the world. Its newly developed CAD/CAM processing capabilities are recognized as among the most advanced in the industry. To view our large selection of clinical videos, CE courses and products and services, visit the Glidewell Laboratories website, http://www.glidewelldental.com. Inclusive is a registered trademark of Inclusive Dental Systems. BioTemps and BruxZir are registered trademarks of Glidewell Laboratories. IPS e.max is a registered trademark of Ivoclar Vivadent. The Inclusive Tooth Replacement Solution makes implant dentistry more predictable, precise and affordable.